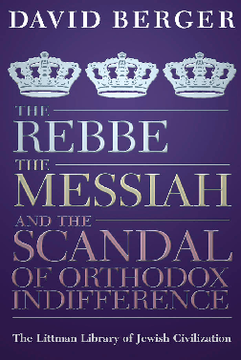 This book is a history, an indictment, a lament, and an appeal, focusing on the messianic trend in Lubavitch hasidism. It demonstrates how hasidim who affirm the dead Rebbe's messiahship have abandoned one of Judaism's core beliefs in favour of adherence to the doctrine of a second coming. At the same time, it decries the remarkable equanimity with which the standard-bearers of Orthodoxy have granted legitimacy to this development by continuing to recognize such believers as Orthodox Jews in good standing. This dramatic abandonment of the age-old Jewish resistance to a quintessentially Christian belief is a development of striking importance for the history of religions, and it is an earthquake in the history of Judaism. David Berger chronicles the unfolding of this development from a personal viewpoint. He describes the growing concern that impelled him to undertake an anti-messianist campaign-publications, correspondence, and the sponsorship of a Rabbinical Council of America resolution excluding this belief from authentic Judaism. He argues that a large number, almost certainly a substantial majority, of Lubavitch hasidim believe in the Rebbe's messiahship; a significant segment, including educators in the central institutions of the movement, maintain a theology that goes beyond posthumous messianism to the affirmation that the Rebbe is pure divinity. While many Jews see Lubavitch as a marginal phenomenon, its influence is in fact growing at a remarkable rate-to the point where its representatives are poised to dominate Orthodox religious institutions not merely in isolated outposts but in several major countries throughout the world. This book analyses the boundaries of Judaism's messianic faith and its conception of God. It assesses the threat posed by the messianists of Lubavitch and points to the consequences, ranging from undermining a fundamental argument against the Christian mission to calling into question the kosher status of many foods and ritual objects prepared under Lubavitch supervision. Finally, it proposes a strategy to protect authentic Judaism from this assault. David Berger, who received his Ph.D. from Columbia University and rabbinic ordination from the Rabbi Isaac Elchanan Theological Seminary at Yeshiva University, is Professor of History at the Bernard Revel Graduate School of Yeshiva University. For many years he was Broeklundian Professor of History at Brooklyn College and the Graduate Center of the City University of New York and co-chair of the Academic Advisory Committee of the National Foundation for Jewish Culture. He is a Fellow and Executive Committee member of the American Academy for Jewish Research, and a member of the Council of the World Union of Jewish Studies, the Academic Committee of the Rothschild Foundation Europe, and the editorial board of Tradition. He has been a visiting professor at Harvard and Yale, and from 1998 to 2000, he served as President of the Association for Jewish Studies. He is the author of 'The Jewish-Christian Debate in the High Middle Ages' (1979), which was awarded the John Nicholas Brown Prize by the Medieval Academy of America, and co-author of 'Judaism’s Encounter with Other Cultures: Rejection or Integration?' (1997), a finalist for the National Jewish Book Award in Jewish Thought. 2 The New Messianism: Passing Phenomenon or Turning Point in the History of Judaism? 14 What Must Be Done?